Initial repair of pulmonary vein stenosis was done by direct venous anastomosis; however these were associated with poor outcomes. The “sutureless” neoatrium technique was initially described post-repair PVS) and given the initial success, it has become widely adopted as a repair technique for primary PVS and post-repair PVS (figure 1) (Yun J et al, 2005). In addition, it has also been applied to primary repair of total anomalous pulmonary venous connection (Shi G, 2017). First described in the late 90s, the sutureless technique demonstrated superior outcomes to relieve anastomotic stenosis following post repair PVS (Najm HK et al, 1998; Lacour-Gayet F et al, 1996). The sutureless technique uses a seemingly simple concept of an atriopericardial anastomosis to allow for aggressive resection of stenosis while minimizing intimal injury and anatomical distortion at the venoatrial junction. Initial success led to the adoption of the sutureless technique for repair of congenital PVS; however, a clear survival benefit remains difficult to demonstrate given the relatively small number of patients in most series. In the most recent series published, following a multimodal approach including surgical intervention with the sutureless repair, survival at 2 years is 57%. The adoption of the sutureless technique as a prophylaxis therapy for primary repair of the total anomalous drainage of the pulmonary veins. A recent series of 768 patients demonstrated an advantage of sutureless repair technique in limiting restenosis compared to a conventional repair in those with preoperative pulmonary vein obstruction (Shi G et al, 2017). Surgical interventions for PVS can also involve more extensive repairs that realign the atrial septum to provide favourable geometry. In addition, removal of previous placed stents can create complexity and risk to the repair. Importantly, for some patients, there is evidence of external compression that contributes to PVS clinical picture. External compression is typically seen in single ventricle children ( Kotani Y et al, 2015) and this can limit the effectiveness of a sutureless repair, if not also addressed. Figure 1. Sutureless repair for TAPVC. 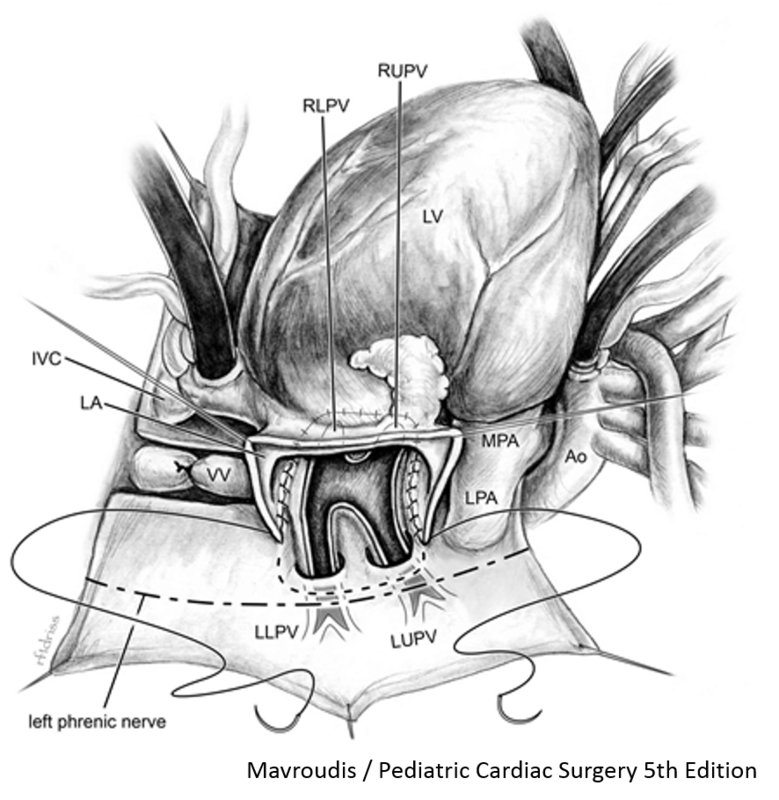 Principles of the sutureless repair are resection of the stenotic pulmonary veins and incision into the left atrium. The “sutureless” repair involves suturing the left atrium to the adventitia of the pericardium adjacent to the pulmonary veins, staying away from the actual edge of the pulmonary veins.